Getting started with HRA Cloud's new Workplace, Health & Safety Module (WHS) is simple and straightforward, involving the following key steps. The foundation for the WHS module is set via core HRA Cloud. You will need to first ensure that core HRA Cloud has been set up. HRA Cloud's WHS Module is powered by Self Service. You will also need to make sure that Self Service has been set up. Businesses will need to identify the Manager/s who should have access to and be able to control the management of the new WHS module. For more information on how to create new users, please refer to the How to Create a New User article. For more information on how to control the different levels of access for new or existing users, please refer to the WHS Access and Security Roles article. It is recommended that any current and active business specific WHS policies / procedures are uploaded under the ‘Our WHS Resources’ tab via the 'Upload' button. Please keep in mind that any sub-tabs that include the words ‘Shown in eSS’ will provide eSS users with access to these documents directly from their Self Service portal. Businesses can set up their safety management system by focusing on the set of workflows available under 'Lead Safety'. Businesses should start with the 'Setting Up Workplace, Health and Safety Policies and Procedures' checklist and can take their time in working through each section according to priority. As part of completing this checklist, businesses will be prompted to create the following WHS documentation and tools. Please note that you have the option to skip items that are not relevant and/or link your existing company specific WHS documentation to the relevant step (provided you have already uploaded these as per the previous step 4). Businesses are encouraged to train their WHS users by explaining the purpose of the module and how it is to be used across the business. Examples of potential WHS Administrators include Workplace, Health and Safety Managers, Site Managers, Contractor Managers, Volunteer Managers and Team Managers. Undertake a WHS Induction across all workers and as part of the induction train your workers on how to report hazards and incidents in Self Service and show them where your key safety information is located. 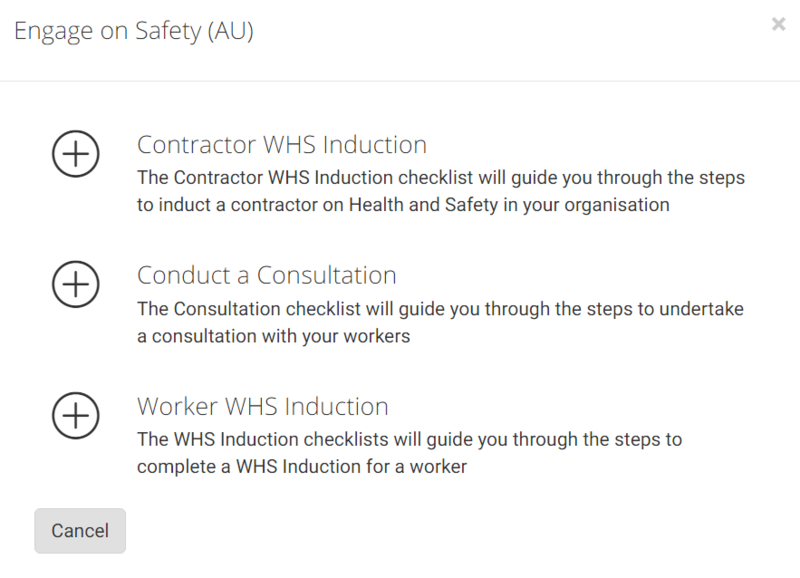 We recommend the WHS Induction is undertaken periodically across all staff to ensure they are aware of the health and safety processes and procedures in your organisation. Contact Client Experience for assistance.